The proliferation of firearms remains a priority within the SAPS and every endeavour is being made de-resource criminals and prevent the circulation of firearms which are being used to commit crimes. Today 18/1, during an intelligence-driven operation conducted by various units at a farm in Stutterheim, several firearms including two (2) rifles with a magazine and thirty-one rounds of ammunition were seized. 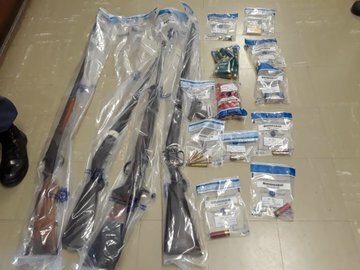 A male aged 40 was arrested and faces a charge of unlawful possession of firearms and ammunition. During the operation another male aged 54 was arrested for Unlawful possession of firearms and unlawful possession of ammunition. Several firearms including two rifles, a .22 pistol, 2 12 gauge shotguns and over 100 rifle rounds were seized. Acting Prov Commissioner Maj GEN Andre Swart applauded the team and warned criminals, “Our specialised team are gathering information on the criminals’ plans. Over the last couple of weeks we have made major breakthrough and will continue to do so. Let our actions spread among the criminal community that we are out there to get you!" added General Swart.